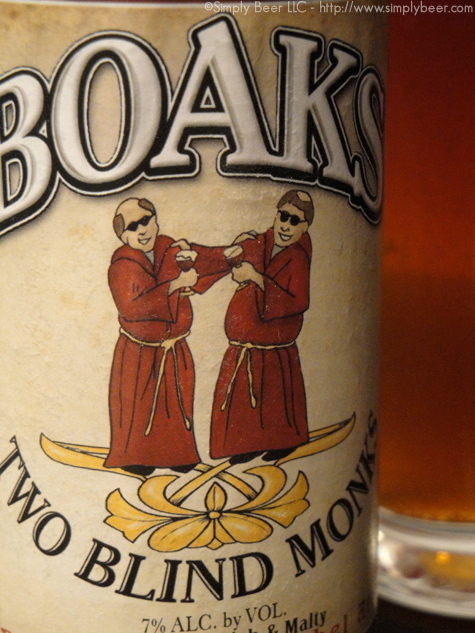 Most of you have probably never heard of Boaks Beer even if you live in New Jersey where it is brewed. Boaks is about a small as a brewery can get. The owner, brewmaster, book keepers, sales rep and distributer is Brain Boak. Ahhh… but, the wonderful thing about the craft beer industry, big does not mean better. Boaks beer has a lineup of four beers Abbey Brown, Double BW, Monster Mash, and Two Blind Monks. Before I get into the Review of Two Blind Monks, if you find a bottle of Monster Mash Russian Imperial Stout, buy 2, drink one same another for a year or 2. A Belgian Dubbel, a style that originated in the monasteries in the Middle Ages. This beer is rich, malty and raisiny with a touch of caramel flavor. Being one of our bigger beers this should be enjoyed in moderation. A hazy brown ale, slightly reddish, lots of carbonation and a ton of sediment that I stirred up not realizing it was on the bottom of the bottle. Poured with a decent head for the style which quickly fizzled from the carbonation leaving a collar of foam. Strong fruity esters, big yeasty presence with some herbal phenols and caramel. Smelled like a big classical Belgian Dubbel. Strong and complex, yet also clean. The esters carry through to the flavor, raisin and dried fruit. It is also had a big malty caramel profile. There was a bit of a honey or candi sugar sweetness on the back end. This is a great example of a Belgian Style Dubbel. It was complex, lots of esters and phenols balance well with the malt and caramel. Unfortunately it is only distributed in NJ, Eastern Pa and parts of Connecticut. There ya go! I’m from Jersey and never heard of Boaks! Now I have, and it sounds like they make some nice beers! Scott, head over to the Totowa Wine Depot(?) or Buy Rite in S. Plainfield and get some. You can also usually find it on Draft at Andy’s Corner Bar. 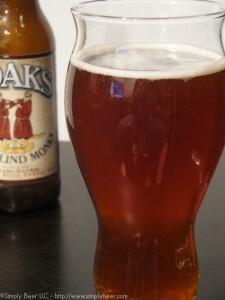 Last week I tried the Two Blind Monks, and I am a convert. Wow, delicious. So this week I got a 4-pack of Monster Mash, and will be trying what you suggest: have one now and save the rest to age. I got them at Gary’s in Madison.